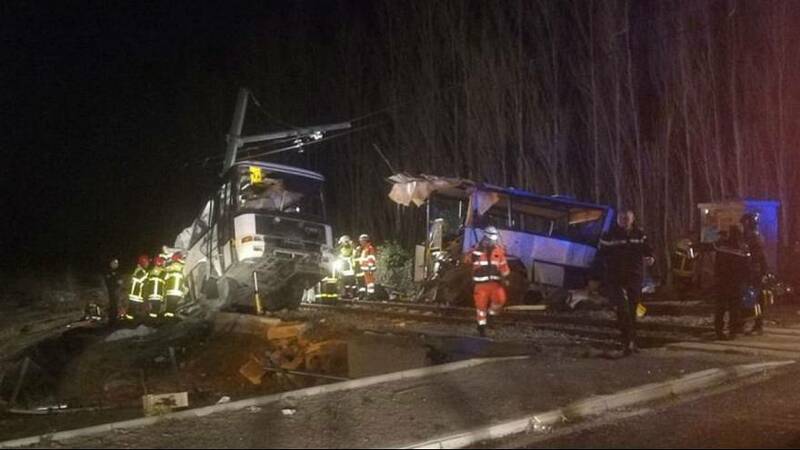 A train has collided with a school bus near Perpignan in southern France, killing at least four teenagers, the French Interior Ministry has confirmed. A regional train is said to have crashed into the school bus at a level crossing at Millas in the Pyrenees-Orientales department, at around 4pm local time. Twenty people were injured, 11 seriously, said French prime minister Edouard Philippe, who travelled to the scene of the collision. France’s transport minister Elisabeth Borne described the collision as a “terrible accident” and also travelled to Perpignan. “Emergency and public services are fully mobilised,” she said on Twitter. The emergency services launched an operation designed to deal with multiple casualties, mobilising firefighters, ambulances and helicopters. President Emmanuel Macron expressed his sympathy for the victims and their families via Twitter, pledging the "total mobilisation" of the French state for the emergency operation. A spokeswoman for the French national rail company the SNCF said the train was running at 80 kilometres an hour at the time of the accident and 25 peple were on board. Three of those were slightly injured. The accident has immediately provoked a debate about transport safety in France, especially around level crossings. This looks set to be one of the worst train accidents in the country in recent years.